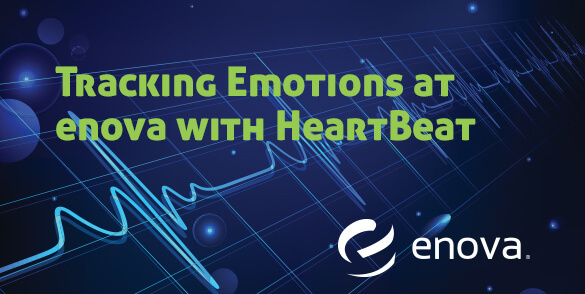 HeartBeat – Checking Our Pulse - Enova International, Inc.
About 8 months ago, in the software engineering department here at Enova, we created a group called the Culture Guild. The purpose of the Culture Guild is to examine the culture of our department. We meet twice a month with the intention of finding new ways to improve not just the culture within our own team, but the culture of Enova as well. The first thing the Guild did was create a value set — employing the values of craftsmanship, community, communication and awareness, balanced pragmatism, and shared ownership. In true Enova fashion, we wanted to take a data-driven approach to measuring just how well we are living our values. Thus, we came up with a tool we call HeartBeat. HeartBeat is a quick survey given out each week, asking each respondent to rate how well we are employing each of our values, on a scale from 1 to 4. The purpose of the 4-point scale is that the respondent must choose a side — either we’re doing well, or we aren’t. Unfortunately, after a couple weeks, we saw that our overall results for almost all of our values were a flat line, averaging around 3.3. This was because some of our values don’t have clear definitions, and can become tough to measure on a week-to-week basis. The Guild realized that we were ultimately trying to find out if the people in our department were happy, and instead of asking about our values, we should simply ask them if they’re happy instead. Thus, we modified HeartBeat to ask about happiness, empathy, trust, focus and community. We still kept the 4-point scale, as we think it’s important for respondents to choose a side. These new questions helped us gain much more valuable data. After a couple months, the Guild started to do some analysis to see what HeartBeat would reveal. We saw that certain questions we were asking correlated with others quite highly. For example, happiness and focus are tightly connected with each other, as are community and empathy. These insights have already proven useful. Each week at Enova we have a one-on-one with our managers to discuss how things are going. Because of HeartBeat, managers are making sure to ask about focus, and are working to eliminate things that might limit it. We often work with small teams here, so to help increase community, the Guild has introduced some events allowing people to get to know each other better, and hopefully increase empathy. With just a couple of months of data, we are already finding great uses for HeartBeat. In the future, we want to further increase our developmental efforts into HeartBeat. Recently, we have introduced the concept of tags, allowing anyone that fills out HeartBeat to use their team or project tag. This helps us break down results at more then just a broad level. We also want to build out a data dashboard, helping us to get our information even faster. We are also working on tagging certain events to certain weeks. For instance, if there is a major release that goes particularly well, and everyone is feeling happy, we want to be able to track that happiness to the success of that release. Finally, we are working on building out user profiles, making it easy to access your personal HeartBeat history. In the few short months we have been using HeartBeat, we’ve been very happy with how it’s helped us analyze ourselves and our teams, and the ways that it has allowed us to take steps toward making everyone happier. If you wish to learn more about HeartBeat, or would like to use the tool, please reach out to me at dkaplan@enova.com.